The styling of a contemporary bi-fold meets durable vegan synthetic microfibre with this wallet to give you a classic wallet that’s as attractive as it is durable. 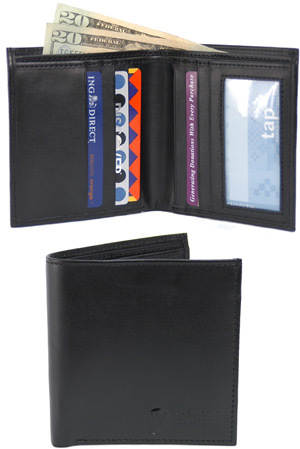 This wallet features 6 card slots, 2 interior slip pockets, a clear ID window and two bill pockets to keep your cash well organized. Wallet measures 4” x 4.25” closed. Available in Black (pictured) and Brown. $22.99 each. From Justin of Roselle, New Jersey on 1/27/2012 . I am extremely pleased with this wallet. It looks good and has proven to be very durable as well since I am constantly using all of the compartments for items such as train passes, business cards, my license which I remove and reinsert daily. Honestly, it is the best wallet I have ever had and is a great value.